Proper rig tune is key to sail performance. But what if you don’t sail a one design boat that comes with comprehensive tuning charts? Quantum’s George Szabo shares how to build a tuning guide from scratch for your rig. Tuning guides create an organized way to shift gears and maintain performance as conditions change, track performance, and record settings for repeatability. Here is how I approach creating a tuning guide. It can serve as a template for you to follow as your make your own guide. Click here for a more in-depth look at how to adjust your rig for performance. Turnbuckles – these are often measured in number of turns from a base. If you don’t know the base, you can measure the distance between the threaded rods as a starting point. Shroud tension and positon – this one is tough to do without a tool. A Loos Gauge is a popular option. If you don’t have one, ask your one-design buddy to borrow one for the day. Mast rake – On a calm day, with the mast centered side to side, attach a weight to the end of the main halyard and measure the distance between the weight and the base of the mast. Next, adjust the rig so that everything is as square as possible. Then write down all of the new numbers. 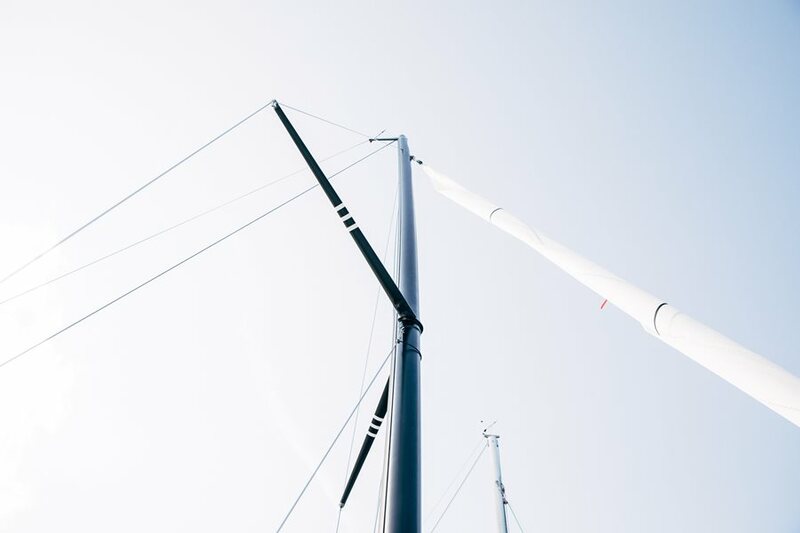 Depending on the features of your boat and what is adjustable, check the athwartships tuning (if the mast is centered side to side), make sure the shrouds are even, and, if possible, adjust the centerboards, rudders, and mast step. After you get your baseline, it’s time to go sailing. While sailing, I try to take a methodical approach to each adjustment I make to affect a certain change. Capture this information and use it to help dial in your settings for various conditions and to diagnose issues. For example, a general performance issues affected by rig tune is the inability to point. If you’re in this spot, try this process: Start by adjusting the jib trim, then work through these options, making a note of what’s working and what’s not. Move the jib lead aft and re-trim the jib, inhaul more, traveler up, ease the backstay, Cunningham, and/or outhaul. If that doesn’t fix it, it’s time to adjust the rig. Loosen the shroud tension to create more rig sag. Once you move something, write it down! If the new setting is worse, no problem; just move it back and keep experimenting until you’re dialed in. When the boat is fast and performing the way you want it to, MARK EVERYTHING and write it down. At Snipe Nationals a few years ago, we came around a leeward mark and were going the same speed as the previous beat, but this time we had extreme height. It was great, but I had no idea why it was happening. My crew and I looked around, and finally we discovered the outhaul was still off from the run. My team member asked if she should put it back, and I said “No, we’re going great.” That change made it to my grid and tuning guide. That evening we shared the tip with customers, and they all had better finishes the next day. You don’t need to go through this process each time you head out, but as you sail in various conditions, start experimenting by adjusting settings to tweak your performance and record what you find. Eventually, you’ll have go-to fast settings for different conditions. At this point it’s time to start filling in your tuning grid. We put together a comprehensive templete for you to use; you can download it here or below. You’ll likely be missing a few notes in some wind speeds, so until you find what really works in that wind speed, try an average of the setting above and below to start. At first, this might seem overwhelming, but by testing things and not being afraid to move something back if it is wrong, you’ll find yourself making smaller and more frequent changes to improve speed and performance. Use this tuning grid as a template to build your own. I make one for every new boat I sail on or team I sail with. Even if it’s a boat type I’ve already recorded a guide for, I’ll make a grid for that boat. I often find minor differences among the boats I sail. Below are the blank templates for you to download and print to fill out. If you’re struggling with any of this or you’d like an expert hand, give your local Quantum rep a call. We’re happy to assist in tuning your rig or helping you troubleshoot performance issues.